Aaand it turns out I was wrong. But at least the combat is excellent. With a Spider-Man title, it’s important to talk about the web swinging and the combat up front. Insomniac’s Spider-Man features probably the best swinging mechanics to date. Once you know what you’re doing, you can move around the city very fast, and it’s consistently fun to do. Fast travel options are introduced after a while too though, when you really just want to get another mission initiated. The combat is likewise the best it has ever been. It feels like a more agile and evolved version of the combat in the Arkham games. Spidey can punch dudes all day long if he wants, but it’s actually easier to win if you take advantage of the full suite of combat strategies offered. For instance, Spider-Man can defy gravity and do combos in the air, which deal more damage and keep him out of range of melee attacks. He can also tie up enemies in webbing; enemies who are webbed to the ground, walls, or any other surface are treated as instantly defeated, so employing this tactic against strong enemies makes battles a lot faster. And if that weren’t enough, Spider-Man also has several powerful gadgets he can deploy, like a tripwire and a drone with lasers. 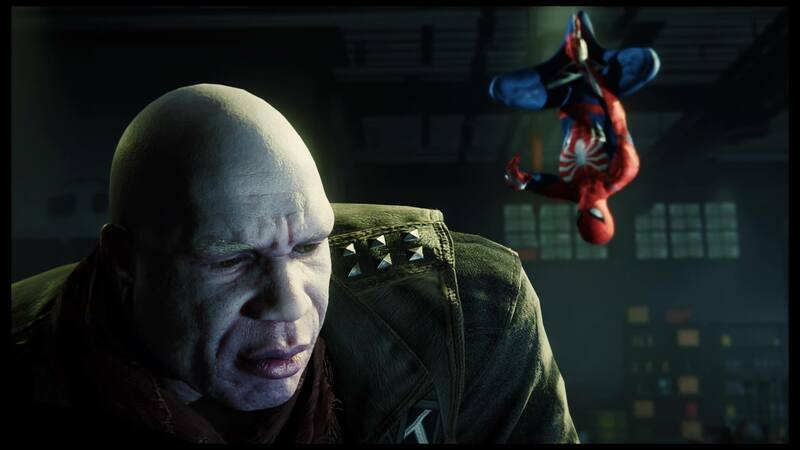 These can be used in the midst of battle or for stealth, and like in the Arkham games, Spider-Man can perform takedowns that eliminate enemies without alerting others to his presence. The bottom line is that there is just an amazing amount of variety in how you can approach combat in this game. 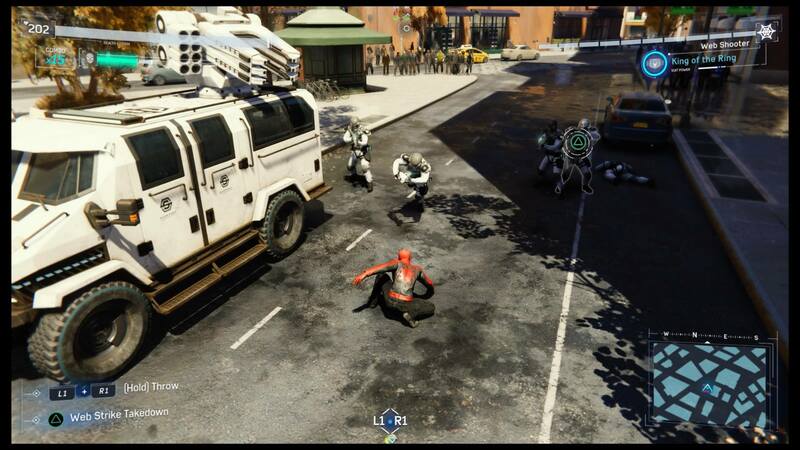 Spider-Man can level up and collect various tokens around the map to unlock new abilities and outfits too, further expanding his capabilities. There are a bazillion ways to knock out these doofuses. However, the controls can be finicky at times. Dodging (which gets a dedicated button) is as integral an aspect of combat as the actual fighting, and Peter’s Spider Sense flickers over his head to clue the player to get out of the way of danger. There were more than a few times where I could’ve sworn I pressed the dodge button in time and still got hit. There were also many times where Spider-Man targeted the wrong enemy with his web attacks, messing up my strategy and leaving me open to get hit. Even the web swinging went off the rails for me sometimes. Ultimately, the controls are very complex, but a lot is achieved with that complexity. The controls could be a little tighter, but they don’t really damage the experience. This is Spider-Man at peak performance. This is a really beautiful game. The character model textures are awesome. Spider-Man takes place exclusively on the island of Manhattan, albeit a fictionalized version that doesn’t have a McDonald’s or a Dunkin’ Donuts punctuating every street corner. It’s a pretty respectable, if slightly bland interpretation of the city, and my favorite detail was the inclusion of the famous “Stand clear of the closing doors, please,” voice near a train terminal. 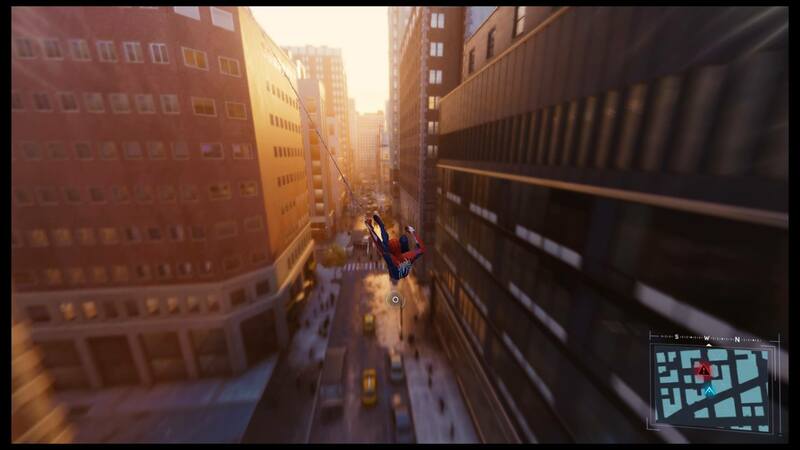 Manhattan is a fun place for some web-swinging. Just like with the combat, there is a wide variety of different side missions and spontaneous challenges to tackle in the city. However, this is where the game’s problems begin. Not all of the different types of content in this game are actually fun to play. Even worse, some of the content that is fun gets recycled so badly that even those things start to lose their luster. For an example of the former: One set of side missions has Spider-Man chasing pigeons across the city. It’s not hard, but it’s not fun either. It’s mostly just stupid. It feels like busywork intended to pad the game’s length. Many of the game’s puzzles feel that way too. In fact, too much of the game starts to feel like busywork as the conclusion of the game is approached. This is when crime really explodes around the city, and Spider-Man can barely reach the end of the block without running into a car chase or a battle between police and criminals. 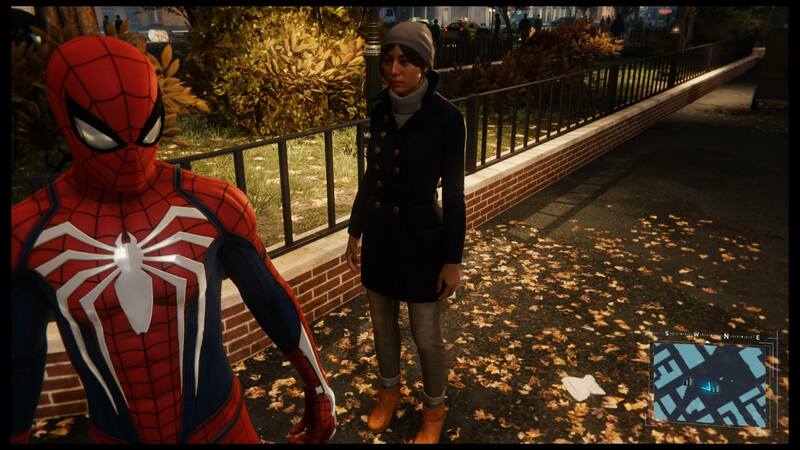 To 100% the game, Spider-Man needs to intervene in all of these conflicts. At first, these battles actually feel exciting and rewarding, but once you’re doing the same exact battle with the same exact enemies on a slightly different street corner for the ninth time, the excitement goes away. It just becomes a chore. I finally just gave up on completing them because I stopped caring. Can’t the city just save itself for once? Regardless, different types of missions give different types of the aforementioned tokens, which are necessary for all gadget upgrades and building new suits, so there are clear benefits to completing them. The only tokens I sometimes found difficult to accumulate were Challenge tokens, which, true to their name, are earned from completing timed challenges of various kinds. More tokens are received based on high performance, and the clock can be very unforgiving. All of the other kinds of tokens are easy to obtain with a bit of effort. Norman Osborn isn’t quite what you expect in this game. The narrative of Spider-Man starts off on a great note: A freshly college-graduated Peter Parker finally takes down the Kingpin, and when he’s not web swinging, he’s working improbably as the assistant to Dr. Otto Octavius (not yet Doctor Octopus). That’s much better than a boring origin story, and having Peter look up to Octavius as a surrogate father is actually a pretty interesting angle. Unfortunately, the story is all downhill from there. Insomniac was not afraid to play with the Spider-Man mythos and introduce familiar characters in unfamiliar ways, and I was perfectly fine with that. The problem is that none of it adds up to anything exciting or new. The biggest twists are ones that you can see coming, and much of it feels like a wasted opportunity. I’m so underwhelmed by the game’s narrative that I don’t even care if Insomniac makes a sequel. My biggest bone to pick is with Mary Jane Watson. She’s one of the most critical characters in Spider-Man’s world, yet in Spider-Man, half her personality has been lobotomized. 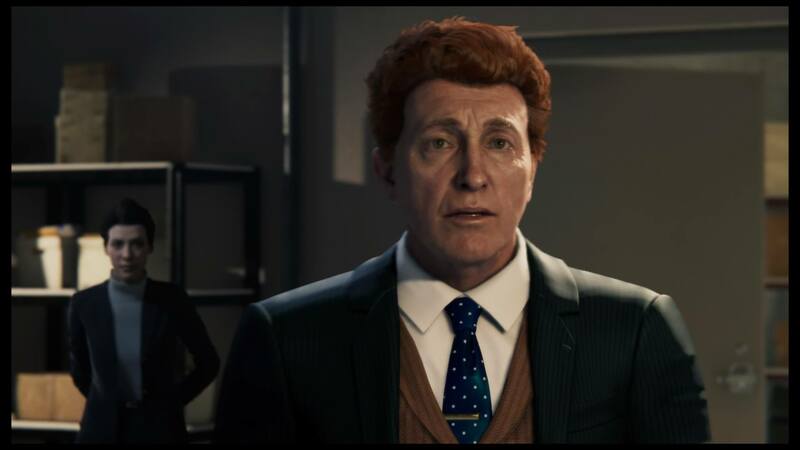 Insomniac made the incredibly lazy decision to turn her into a Daily Bugle reporter, so she acts more like a low-budget Lois Lane than Peter’s beloved MJ. Even worse, there are sections of the game where you play as Mary Jane in stealth sections, and they’re almost all boring and intensely simple. They’re so banal that they actually damage the game’s pacing. The game practically sells itself with screenshots like these. The rest of the story missions are typically pretty entertaining, but I often felt that they were too short or didn’t have enough action. In particular, I found the boss battles to be very disappointing and lacking in imagination. For instance, battling the Vulture ends up following an almost identical pattern to battling Electro, which should not be the case at all. And to add insult to injury, the final boss can be defeated with a strategy of “web him up, punch him, repeat.” It’s so strange that the game fails in the place where it should be easiest to succeed. 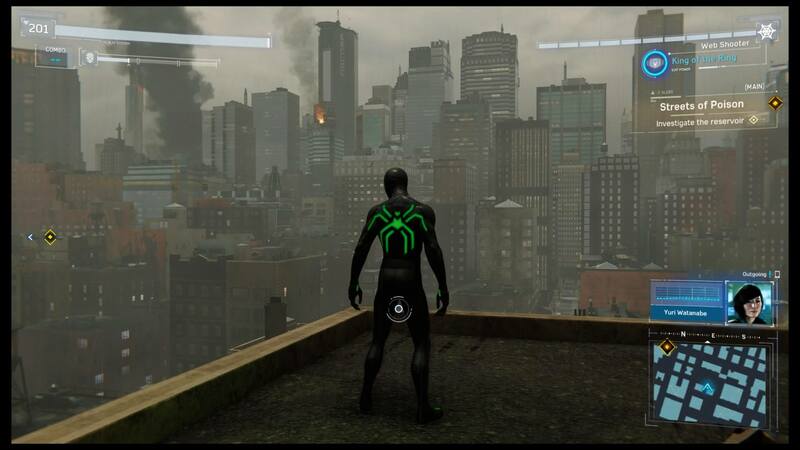 Spider-Man tries to cram a little bit of everything into its experience: gang fighting, car chases, rooftop stealth, Mary Jane stealth, swinging through smog to collect air quality data (yes, really)–it literally makes me wonder if there were any ideas Insomniac had that they didn’t put in the game. It feels to me like every idea, good and bad, was crunched into this game. Sometimes it works, and sometimes it doesn’t. In a nutshell, Spider-Man has excellent combat mechanics and exciting movement that get bogged down by strange side missions, repetitive battles, unimaginative boss fights, and a lame story. I ultimately enjoyed this game a lot, but like I said above, I really don’t care if Spider-Man gets a sequel or not. As a huge Spider-Man fan, I’m sad I feel that way. If You’ve Wondered Where I’ve Been Lately: Yes, it’s been a long time since I last published an article here. A big reason is I moved to South Korea back in March to teach English, which has kept me busy. The other big reason is I’ve become a Copy Editor for Enthusiast Gaming, so I actually have been writing–but for other people. I will try to keep the Professional Writing page current.